The southwest Turkish coast—also called the Turkish Riviera or the Turquoise Coast—makes the most of Mediterranean Turkey. Ancient archaeology lies beyond the confines of coastal villages, ruins are chiseled into rock faces that rise above the sea, and secret, shallow swimming spots invite you right into the Aegean’s pure waters. 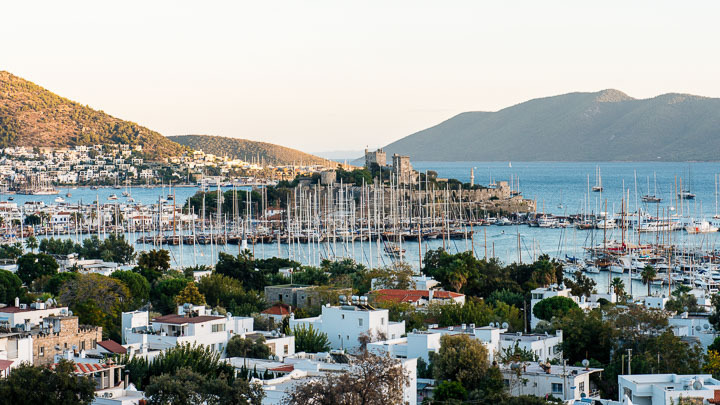 With Turkish gulets bobbing in coves and Bodrum boasting a Wonder of the Ancient World, it’s an area as intriguing for sailors as it is for history seekers. Start your Turkey tour from Istanbul, exploring mosques and monuments on foot, then take to Turkey on a bike, cycling inland on pine-shaded roads where olive trees far outnumber cars. Take your Turkish coffee in towns where the fragrance of fresh-baked bread lingers in the embrace between the mountains and the Mediterranean, then return to a Turkish yacht to catch the sunsets over spectacular ruins, half-tumbled into the sea.